Empaths are highly sensitive souls who are easily misunderstood. They are sensitive, giving, loving, and at times, extremely anxious. An empath craves love but also needs alone time. They cry on the drop of a dime, see things that no one else can see or sense, and a few other quirks. 1. EMPATHS NEED TO BE IN RELATIONSHIPS THAT ARE HONEST AND TRUTHFUL. These people have high sensory levels and can sense things that most cannot. If they feel you are hiding something they will call you out on it. They can feel what is not being said. They can read body language and energies. When in a relationship with an empath you need to always be truthful. They don’t tolerate lies. An empath cannot explain how they know what they know. But, you must know that if you cannot be honest with your feelings you will not survive being with them. They are extremely emotional and will pick up on your own issues. 2. AN EMPATH’S HEART HAS BEEN BROKEN MANY TIMES. They have a deep sense of the emotional world. They can feel other people’s pain and will try to fix it. In return they find themselves with a broken heart. They wear their heart on their sleeve. It’s very difficult to stand back and rationally understand why they can get so self-absorbed with someone else’s drama. But, an empath loves with depth and complete adoration. They feel from the heart and eventually the mind lets them know it is causing pain. To love an empath is to enter an emotional roller coaster of complexities. However, they are also very simple in how they know when something is over and they can move on. They will love you forever but do not necessarily stick around to show you. 3. EMPATHS FEEL MORE THAN WHAT THEY CAN VERBALIZE. These sensitive creatures are born with an ability to feel things before they can even logically make sense of the feelings. 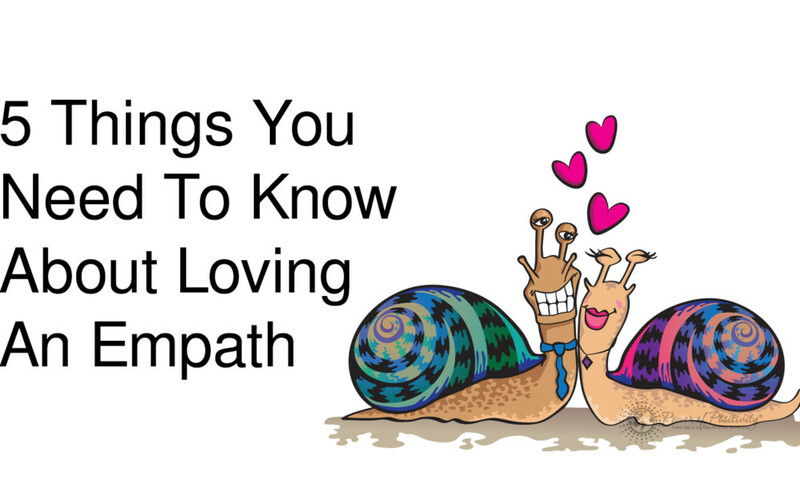 Loving an empath can be rewarding because they live on touch, sound, and other senses. Unfortunately, what they know doesn’t always have a logical explanation. They can be incredible accurate in their information but not be able to tell you how they picked up on it. If you are in a relationship with this type of personality be sure to always be open to your feelings. You might not understand how your energy is portraying to your lover or mate. Loving an empath is like being on a magical carpet ride. You never know where it will take you. Living with an empath means you must detach from watching the news at times. They get overwhelmed by noises and distractions. Part of their survival is about desensitizing. 4. EMPATHS ARE DEEPLY INTENSE AND PASSIONATE. If you show passion and spontaneity, an empath will be lost in your power. They love love. They can feel it from miles away. They are emotionally driven by passion for life, for love, and for the world. To fall in love with empath means to truly see the world through love. These sensitive ones are artists, composers, writers, and creators. They live through their emotional state. Sometimes they are moody and withdrawn as they need alone time to create. Passion comes from the innate fire of understanding humanity and its emotions. They also have a passion for the outdoors. They require nature to be their therapy and if you are in a serious relationship with one of these spirits you better have the ability to get up and go at a moment’s notice. They also need touch and verbal stimulation from their lover. They are hands-on creatures. 5. EMPATHS ARE GIVERS. THEY ARE GIVERS OF LIGHT AND LOVE. They are moved by gifting to those they love. There is a sense of pleasure in knowing they are making you happy. When they feel the appreciation they are yours forever. Never take anything they do for granted. Even a post-it note on a mirror brings joy to them. They believe that quality time is the best gift they can give. They will listen for hours to your problems. These loving souls will try to help you attain your goals. Nothing is impossible as long as they feel that you love them. Empaths are openly expressive and expect that in return from their mate. It’s important to demonstrate your feelings openly to the empath in your life. He/she needs to know that they are being heard and understood. They will keep their emotions bottled up until a moment that they will have a mini breakdown. It’s in these times that they need your support. Take them out on a hike, to the beach, to the park, or any place outdoors. Take them to the zoo or pet store. Empaths love animals. Loving an empath is beautifully rewarding. They are selfless in their love and will do what they can to make you happy. Just remember it is a two-way street. They also require the same attention because if their inkling tells them that you are not “into them” your relationship may not survive. great article, identified with so many of the points and I have had so many examples of similiar situations in my own life. I feel acknowledging you are a empath is part of the path of becoming one and that sometimes being a empath can also have bad traits too.